One the biggest rules you hear from day one is to never mix navy and black! From fashion to interiors, it’s an unspoken interior design rule everyone seems to follow. But mixing navy and black is one of our favorite looks! The rules of interior design sometimes include following your heart, and we definitely love to mix these two colors. In our Formal Sitting Room, we wanted to be as bold as possible. Smaller spaces often allow for dark walls or even wallpaper! We used Restless Sea by Behr to make the space feel moody. Touches of black in the chairs and pillows really help the space feel elevated and more formal. In the dining room of our Mercer Island Project, the black and navy combo feels earthy, rustic, and natural. The space is cool and simple, and we love how the vintage rugs pulls everything together! The Casita Lounge in our Calabasas Remodel remains light and coastal, even when using dark navy and black. It’s the perfect example of how this contrast can brighten the space! There’s a lot of blue and black throughout the OC Ranch Remodel. We tied in this space to the rest of the home by using both colors. The result is effortless contrast and texture! We broke the rule with the black countertops and navy island in this kitchen. Our McGee & Co Storefront storefront is bursting with life! The ship artwork, textured console, and navy and black rug are both neutral and bold. It’s perfect for our beach-y space! This space from our Mercer Island Project is warm and minimal. 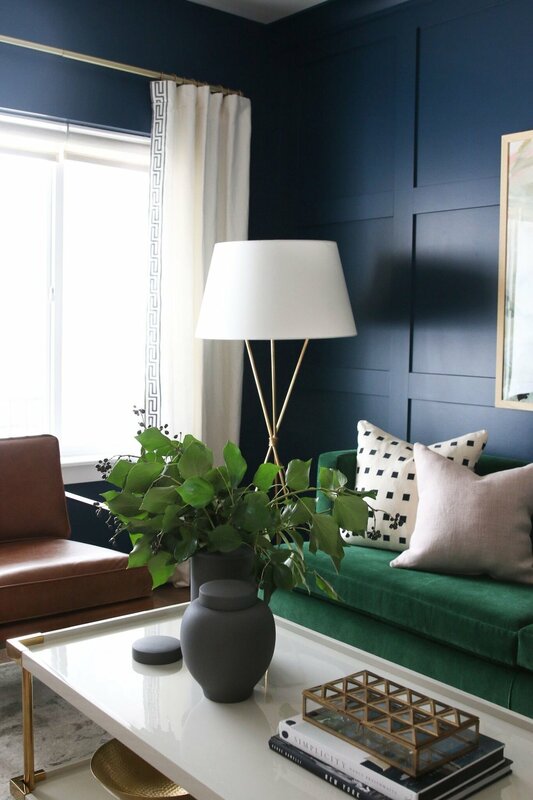 The black light fixtures stand out as clean additions to the space, while the navy couch is inviting.